I regularly update data the drives pages on my data site. Pages on the site are meaningful to me because I recognize the changes over time - as well as seeing changes I anticipate become reality. Today I created a graphic from data that drives the Supply_Costs page, and will use this blog post to attempt to make the graphic meaningful for you. When understood, this chart indicates numerous issues behind rate increases in Ontario - increases which hit a staggering 26% in the second quarter of 2015. To understand the chart it is necessary to understand the two components of electricity pricing in Ontario, particularly the Global Adjustment Mechanism (GAM). The majority of electricity consumed in Ontario is consumed by larger entities billed on the basis of the the power they consume valued at the Hourly Ontario Energy Price (HOEP), plus the global adjustment to recover the full contracted cost of supply. Most consumers are small, and billed at regulated price plan (RPP) rates, but those prices are simply a prediction of what the HOEP and GAM will total. As an example, the average RPP price scheme will average $102/mega-watt hour (10.2 cents per kWh) in the third quarter of 2015, while the monthly averages for HOEP + GA (class B) are similar; $101.99, $103.50 and $103.78 (the last figure is based on the second preliminary estimate of September's global adjustment). ...nuclear and baseload hydroelectric assets would be regulated by the Ontario Energy Board, who would set regulated prices, while the wholesale price for other electricity generated in the province would be set by the market, which would continue to operate as it does now. The chart shows that, indeed, hydro and nuclear continue to moderate electricity prices 10 years later. Numbers may help explain the chart. If consumers are paying $102/MWh for nuclear supply, and the nuclear suppliers are receiving $66/MWh, $36/MWh is going to some other electricity sector cost. With nuclear power generating over 90 million MWh of electricity each year, this GAM is facilitating a very large redistribution of revenues to other suppliers. The prices being moderated are not, as Dwight Duncan foresaw a decade ago, constraining pricing driven higher by market rates - those have been very low. The regulated prices for nuclear and hydro have instead been used to hide the costs of supply contracted at much higher rates. 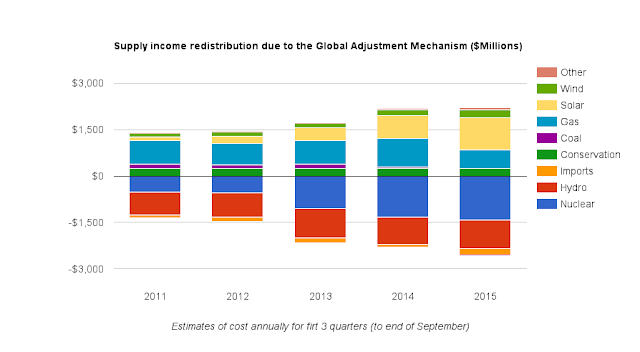 Solar's trend is spectacularly up, to where it is now far and away the greatest beneficiary of the global adjustment mechanism, in my estimates. No estimates are perfect, but I think many are helpful and this one particularly so. The Ontario Energy Board has published (Table 2) a price for solar during this period of 47.3 cents/kWh ($473/MWh). 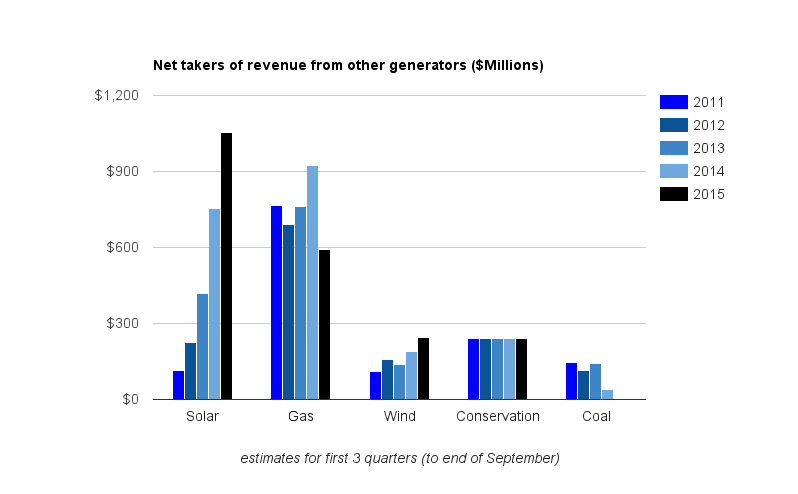 I've posted on problems in estimating the production from solar panels in Ontario, and I've posted on strong evidence my estimates have had merit (in Better Reporting of Ontario's Electricity Generation). The main graphic in this post displays my estimated cost of supply has been less than what Ontario's system, operated by the IESO, has been collecting (if all was accounted for the negative and positive portions of the stacked chart would balance). While charges move from month to month making balancing any one month improbable, the past 3 months have seen the IESO collecting ~$46, $80 and $105 million more than I anticipated. A likely explanation for the variance is that I am underestimating solar production, and thus cost. The IESO reports 1,823.5 megawatts of contracted solar capacity in a Q2-2015 Report, up 48% from the 1,235.3 MW reported for Q2-2014. This is close to my estimated increase in output. Other supply costs that may be higher include conservation, where very little disclosure of spending is made, and wind. Yesterday an article announcing the completion of a wind project was published, but the IESO has yet to report on any production from that site. Data is never perfect, and the quality of data produced by the IESO is deteriorating. Yet data is often sufficient to find trends, such as the solar trend. While this work has nominally been written about electricity, the solar story is not entirely, and perhaps not even primarily, an electricity story. ... There are about 60,000 micro FIT applications in the system. These will have a minimal effect on the global adjustment, but at an estimated two voters per household, this translates into 120,000 or more votes in favor of retaining the FIT program. They were wrong about the impact on the global adjustment, but the point is valid. The cost of electricity is driven higher by what is more an electoral than an electricity program. The same data set I used to produce the graph initialing this work shows in the past 5 years generation from hydroelectric and nuclear supply, primarily from public OPG, has been sold for about $12 billion more than generators received for its production; that $12 billion funding mostly private generators, including non-utility generators contracted decades ago by the Rae government. The sale of Hydro One is in the news these days - as it should be. That too is not an electricity policy. The fall statement of accounts will reveal the stranded debt to be about $8 billion. That's the amount of debt from the broken up Ontario Hydro not felt to be covered in the value of the successor companies. Outlaw Premier Kathleen Wynne has changed laws to avoid using the $8 billion proceeds to pay off a debt that was only ever imagined to have been stranded. I see that disrespect for the value of public assets in the graphic above. 1. The average price for all consumer groups is not $102/MWh. Other consumer segments, specifically large industrial and institutional "class A" consumers pay less than $102, and export sales pay far less as the global adjustment is not charged on those. My supply cost page includes an "IESO_avg" column in the final table, showing 3rd quarter average pricing averaging about $88/MWh. 2. I also updated a Preliminary Monthly Report page today. I'd expected to write a far different post until seeing the IESO's post of the global adjustment 2nd estimate yesterday. With exports well down, and HOEP sharply up, there is something very wrong with that estimate unless costs are being carried forward into September from previous months - and those costs would most likely be for embedded generators, the most impactful being solar generators. I also maintain a weekly data page with graphs also requiring posts to explain. 1 such graph shows the change in generation from the same week the previous year. This week, as last, the graph shows reduced nuclear replaced by natural gas (the use of which shouldn't impact the global adjustment) and reduced exports (here showing as higher "net_import"). This should have been price positive for class B consumers.